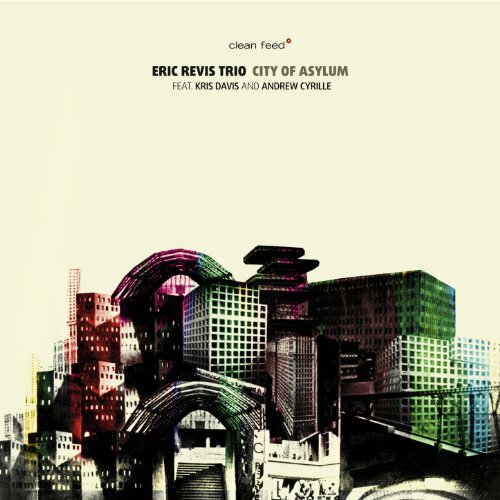 Bassist Eric Revis‘s second album for the Portuguese Clean Feed label, City of Asylum, was recently released. (Buy it from Amazon.) It’s a follow-up of sorts to Parallax, an album featuring saxophonist Ken Vandermark, pianist Jason Moran, and drummer Nasheet Waits. That was an interesting collision, given that Moran, Revis and Waits are all black and all East Coast post-bop masters who’ve worked with Branford Marsalis, Andrew Hill and many, many others (Waits is also the drummer in Moran’s Bandwagon trio); Vandermark, by contrast, is a white, Chicago-based free jazz blower who divides his time between the US and Europe, where he allies himself primarily with players like Peter Brötzmann (with whom Revis has also played), Mats Gustafsson, and Paal Nilssen-Love, among others. It didn’t work all the time, but Parallax had its moments, for sure. City of Asylum shares neither personnel nor thematic commonalities with Parallax. It’s a piano trio date, featuring the bassist, Kris Davis on piano, and Andrew Cyrille on drums. Seven of its 10 tracks are improvisations—the other three are a version of Thelonious Monk‘s “Gallop’s Gallop,” a take on Keith Jarrett‘s “Prayer,” and “Question,” written by Revis. The album’s first two pieces, “Vadim” and “Egon,” demonstrate both the potency of this trio and the risks of unmediated interaction. There’s a lot of potential here—Revis and Cyrille almost establish a groove, Davis almost creates a melody the listener can hang onto—and a tremendous amount of eruptive creativity: stabs and flurries from the keyboard, a thick and driving bass throb, delicately dancing cymbals and evocative taps on the toms. But “Vadim” ends without having gone anywhere, or taken the listener on a journey; it’s just distraction. And “Egon,” pointillist and frenzied, with Revis bowing the bass madly, is even more abstract and less welcoming, and has nothing to do with what’s come before—the group has started all over again, from nothing, and the listener must effectively do the same. When the classically Monkian melody of “Gallop’s Gallop” is the next thing heard, it’s hard to not feel relief wash over you. Even so, Davis strives mightily to dissect and scatter the piece, reducing it to its component notes as Revis and Cyrille pulsate and rattle, avoiding the churning, broken-beat swing that was so essential to Monk’s music. The album continues to vacillate between freely improvised pieces which offer moments of great beauty, but little lasting impact, and composed pieces which do much more. “Sot Avast” has a churning, almost marching rhythm reminiscent of Julius Hemphill‘s “Dogon A.D.,” especially when Revis returns to bowing the bass, creating thick, skull-filling drones. The group’s version of Keith Jarrett‘s “Prayer” is a slowly unfurling flower, easily the disc’s most emotionally resonant moment, while Revis’s composition “Question” has a Monkish feel all its own, and the band swings through it in an abstracted but forceful manner, Davis offering shimmering ripples and hypnotic, repeated phrases from the piano. The title track, which closes the disc, might be the most surprising piece here; Revis plucks some of the highest notes the bass can offer, sounding almost like a violin at times, while Davis darts about the keyboard, notes falling like raindrops on a pond, and Cyrille barely brushes the toms, rumbling like far-off elephants. It’s more like chamber jazz than anything that’s come before, and it demonstrates the possibilities of improvisation, when the players are 100 percent in mental and emotional sync, better than anything else on City of Asylum. This is an album with peaks and valleys, but it’s definitely one of the most interesting piano trio releases of 2013.